Most of the dive spots can be reached within 10 – 45 minutes by boat (Dhoni). The furthest dive spot is about 1 hour away from Reethi Beach. At the moment we visit approx. 60 spots, which are divided into 4 basic categories: thilas (shallow points), outer reefs, island reefs and atoll reefs. Depending on the season we can see a variety of different fish life. 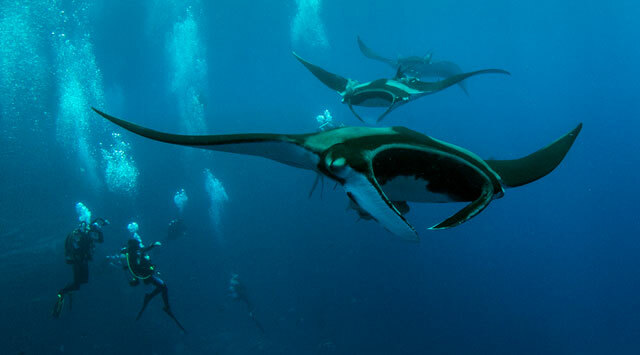 During the south-west monsoon (June – November) we have our “Manta Ray Diving”-season in which we can almost give a 100% guarantee for an encounter with elegant giant rays. The chances of seeing Whale Sharks are much higher in this period than other times of the year. During the north-east monsoon the water is much clearer, the visibility goes up to 40m and the colours seem to be much brighter.